Prophet Elijah: Alone Against All! 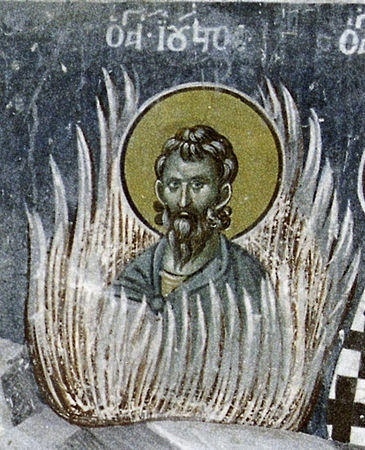 Justus was strangely placed as a sacrifice in the fire. Saint Justus was from the city of Rome, a soldier in a place called Noumera, under the tribune Claudius. Once as he returned from battle against the barbarians, against whom he fought with his fellow soldiers, he entered into ecstasy, and beheld a crystal Cross, and from the Cross there came forth a voice, which taught him the mystery of piety. Therefore upon arriving in Rome, he distributed all of his belongings to the poor, and finding himself alone, he was glad for he acquired faith in Christ. When it was revealed to the tribune Claudius, that the Saint believed in Christ, he took him aside and advised him to pity his youth, and abandon his faith in Christ. Unable to persuade him, Claudius sent him to the governor Magnentius. The governor questioned the Martyr, and he found him to be steadfast in his faith in Christ. For this reason he ordered that he be flogged with raw hides. Then he ordered an iron helmet that was heated in fire to be placed on his head. Meanwhile they were to place iron balls heated in fire under his armpits, and in his hands they were to fit other iron hands. After this they laid him down over a fiery grill. All these things the Saint endured bravely glorifying and thanking God. Then he was put into a furnace, where he delivered his soul into the hands of God, although not even one hair of his was burnt. His Synaxis and Feast is celebrated in the Orphanage.